Hello Hoopla Events’ friends and followers! 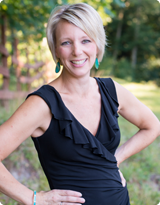 It’s Jen Carver, from Banner Events. 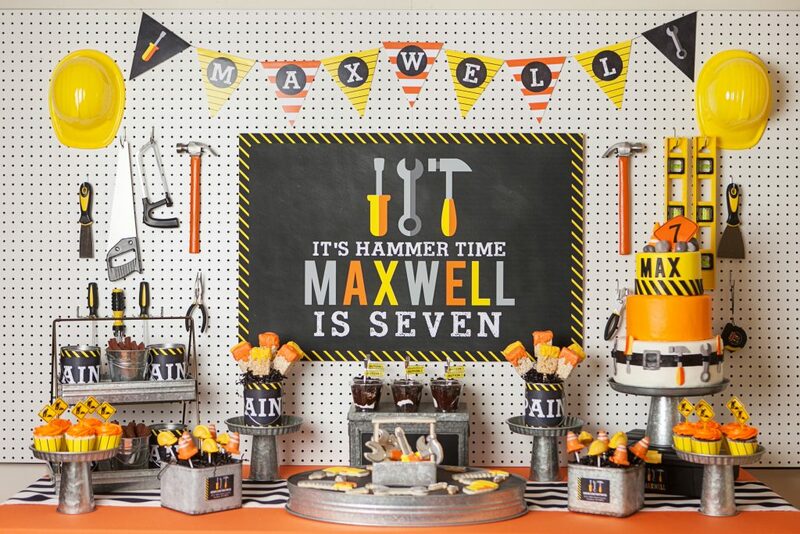 I’m excited to be guest posting on Krista’s website today, sharing a birthday party theme that is especially fun for boys! 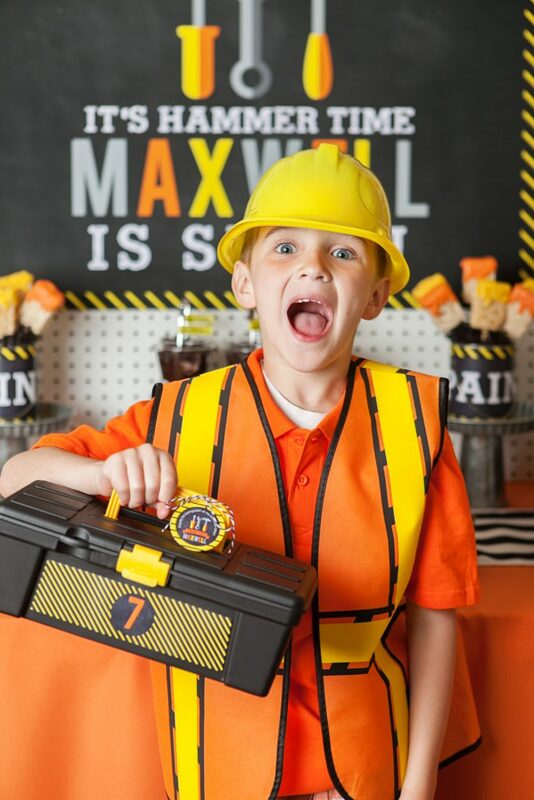 My son Max loves to build things and is often found scavenging supplies and tools from around the house to construct his masterpieces. 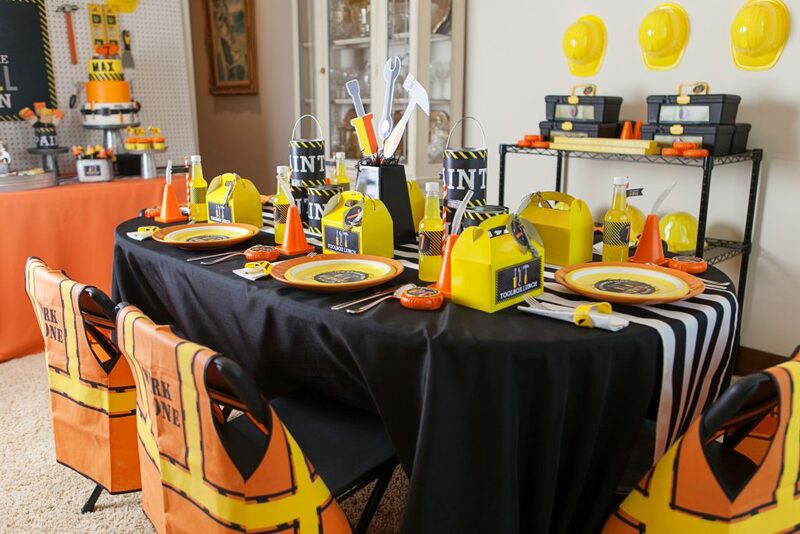 When it came to choosing a party theme, a construction birthday party seemed like a perfect fit. 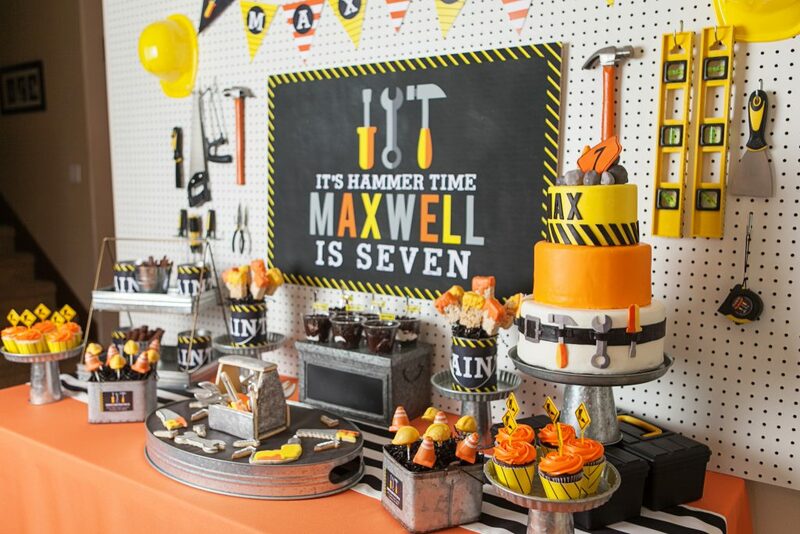 It was so fun to construct the party blueprints and build the foundation for an exciting celebration. 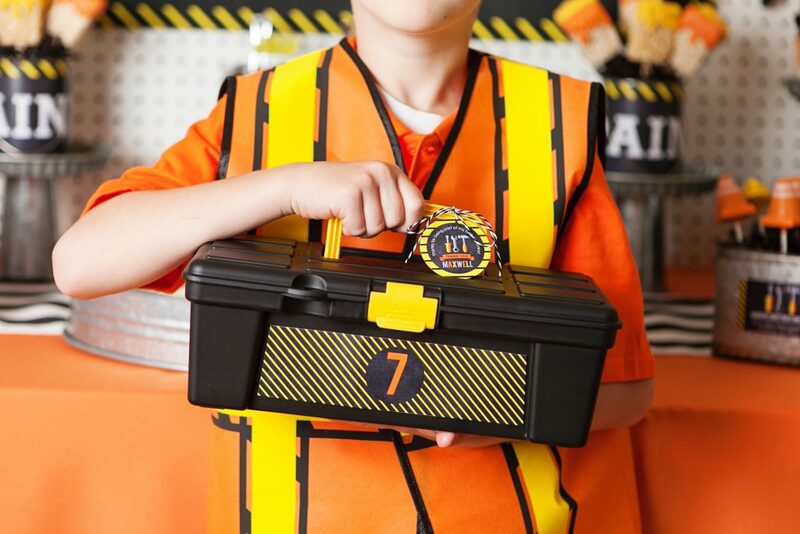 Karina Rigtrup of A Fresh Take Photography captured my little man at work, along with all of his birthday crew! 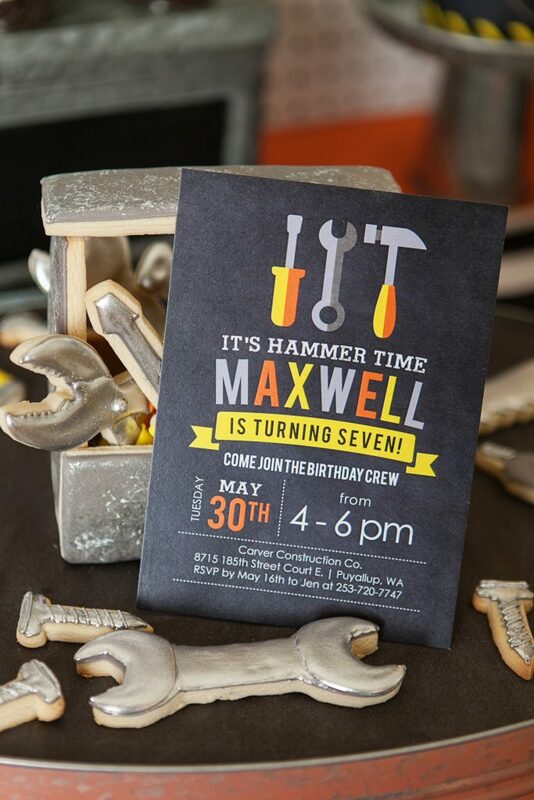 I love building excitement for an event by sending out colorful, theme-coordinating invitations. 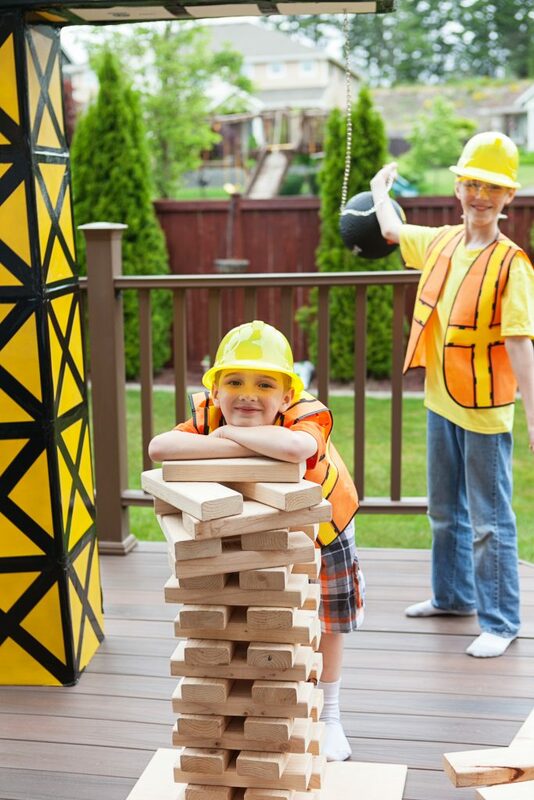 The oft-quoted, “If you build it, they will come” definitely applies to parties. 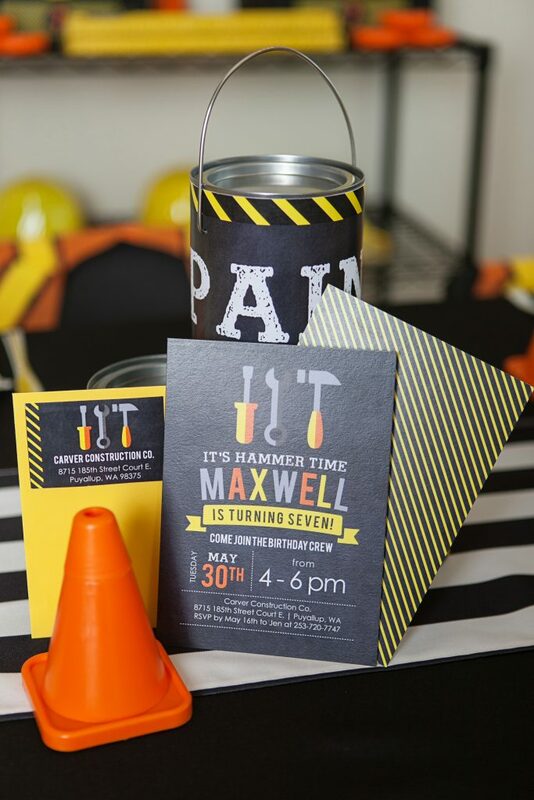 I was thrilled to work with Jessica of Jessica’s Invites for the printable invitation and coordinating items. She was so great to personalize everything for me and even made several custom items just for our party. I highly recommend her work! All of Jessica’s printables were brought to life by my go-to printing company, Driftwood Printing. 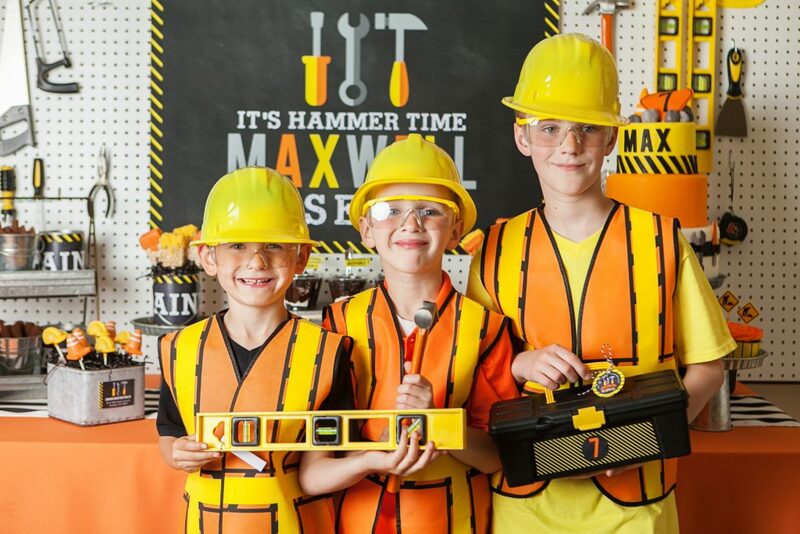 Max’s birthday crew was more than excited about entering the construction zone. 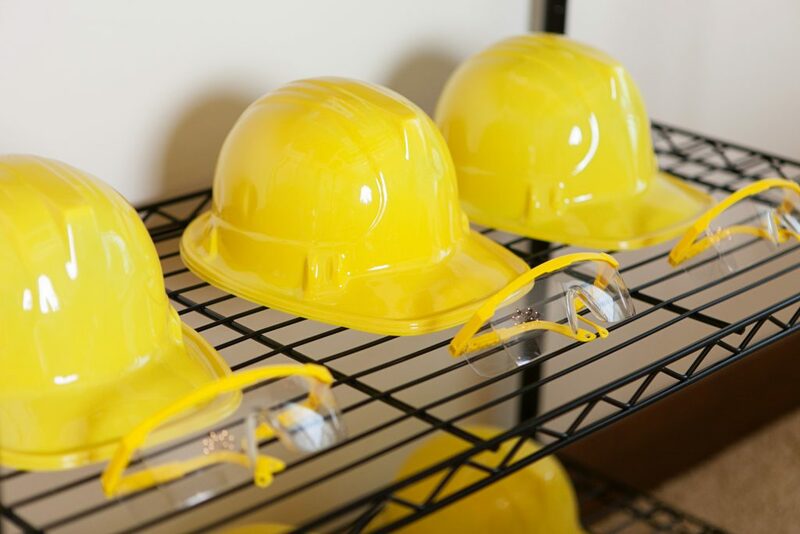 Since this was designated as a hard hat area, guests were outfitted in yellow construction hats and orange construction vests, both available from Oriental Trading Company. The dessert table was so much fun to plan and captured our theme in such a creative way. 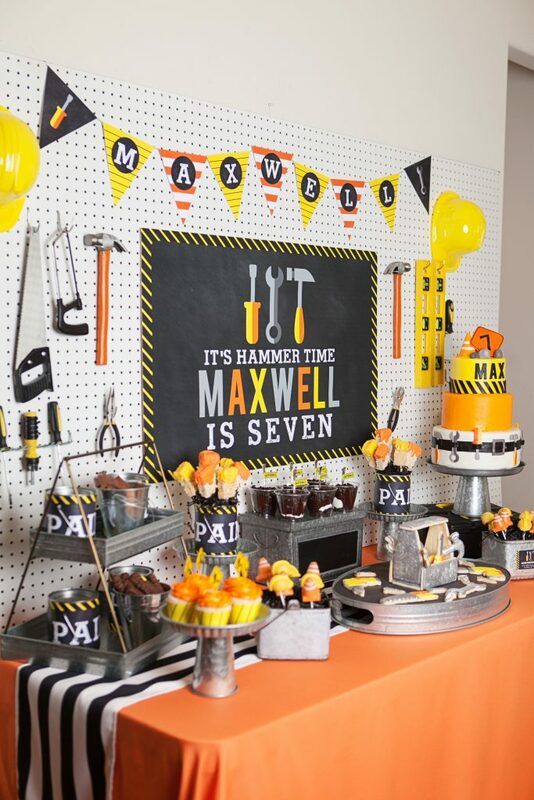 After multiple trips to local home improvement stores for inspiration, I decided to use a piece of inexpensive pegboard as the dessert table backdrop. 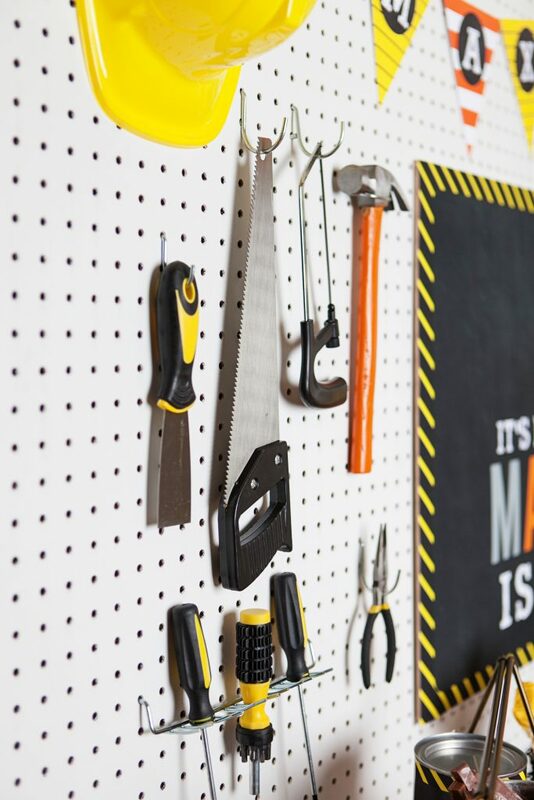 I picked up a package of assorted pegboard hooks to hang a variety of real tools I found for $1 each at our local dollar store. 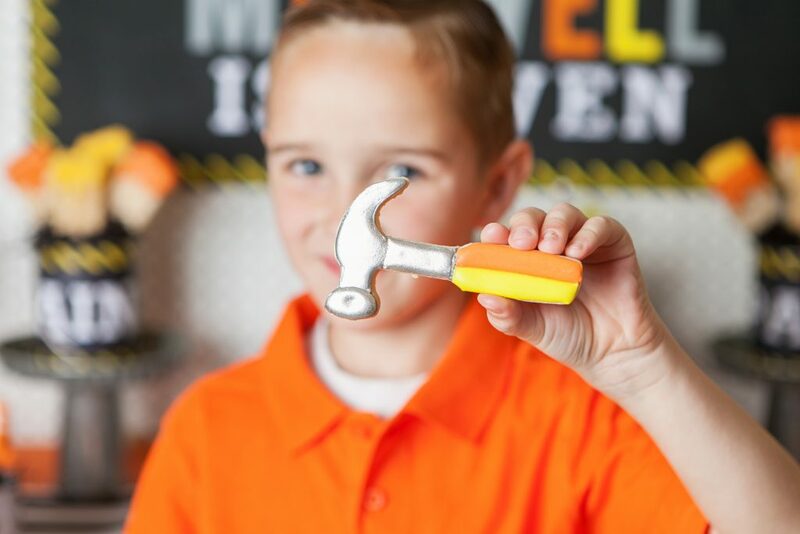 Can you believe that the hammers (I painted the handles orange to coordinate), saws, screwdrivers, pliers, levels, tape measure, and spackling knife were only $1 each? 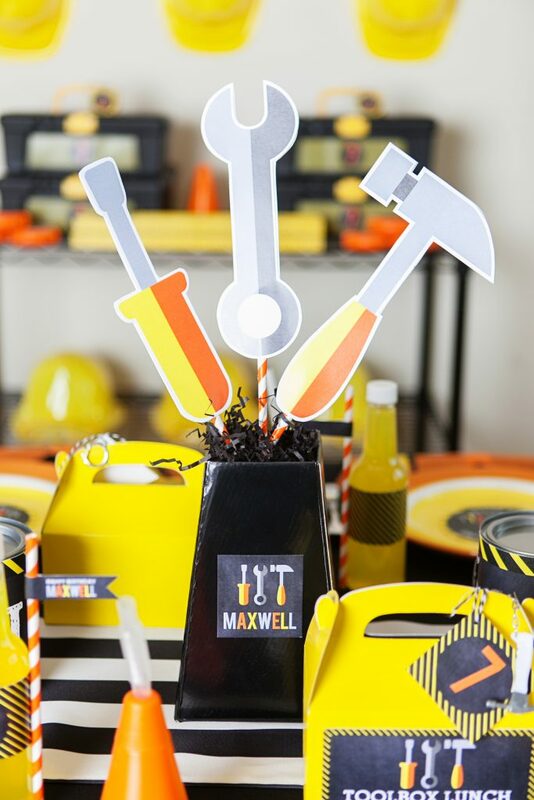 The tools, paired with a printable poster and banner (from Jessica’s Invites) provided the perfect foundation for a table filled with construction inspired treats. 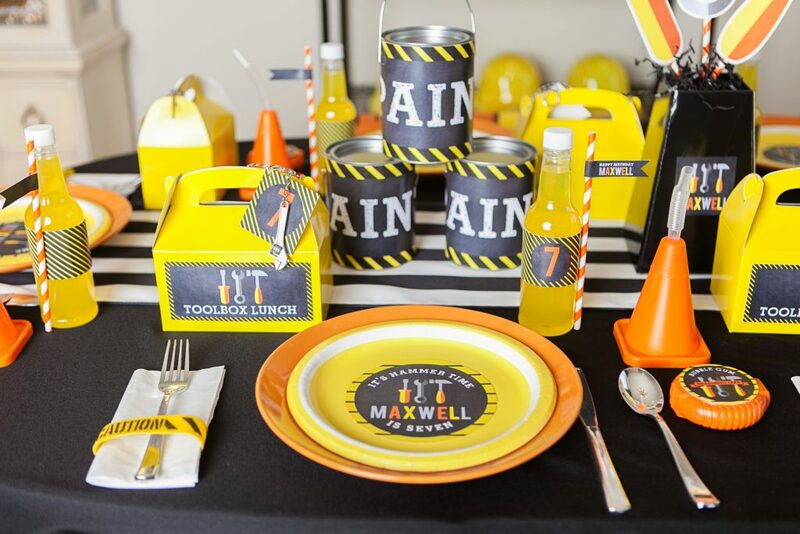 I rounded up galvanized metal cake stands, pails, trays, and tiered serving stands from my collection to display a variety of desserts inspired by the construction party theme. There were so many delicious treats to choose from. Christina Goff, of 4 Kids Cakes, constructed the most amazing 3-tiered cake. 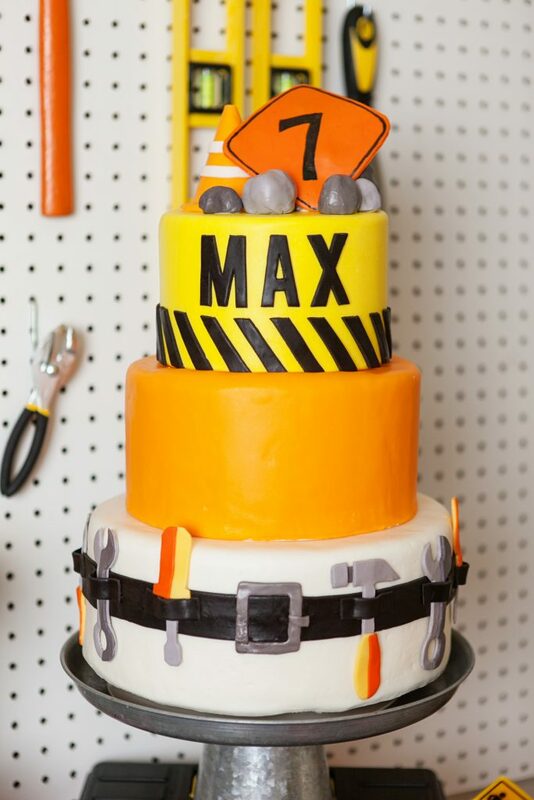 It came complete with a fondant handyman’s tool belt and tools, construction pylon & sign. 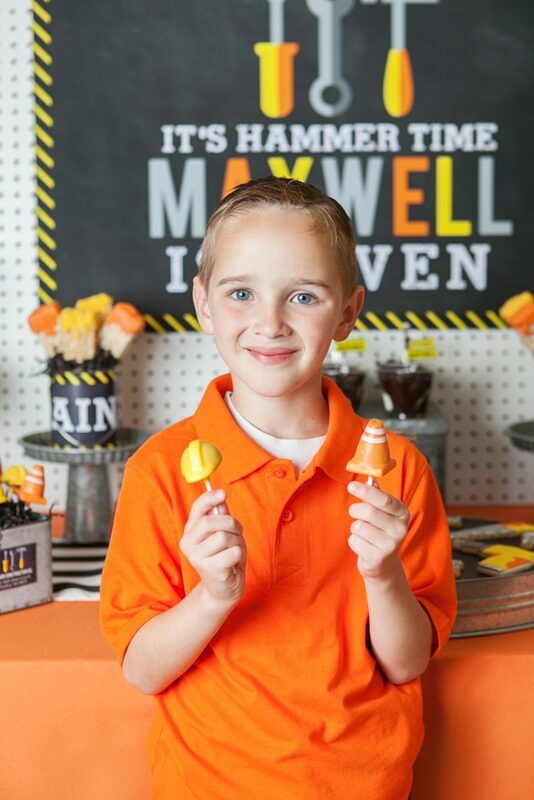 Plus, she even made Max his own mini cake. 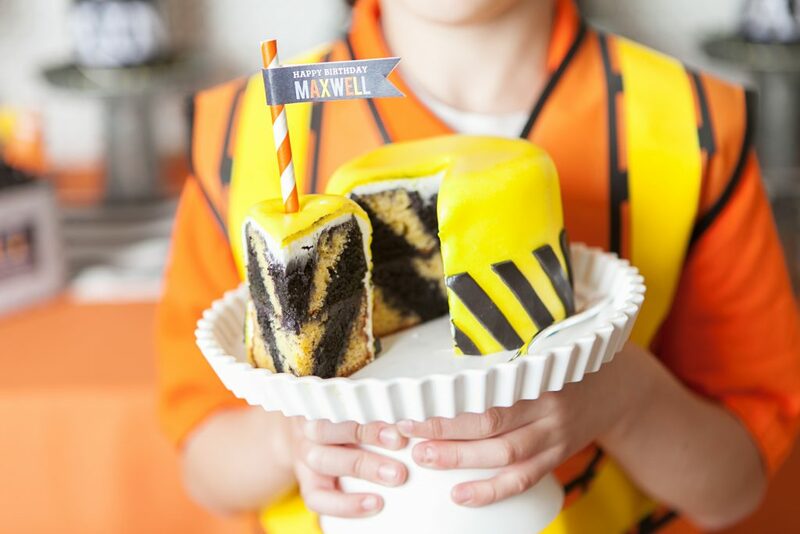 Check out the amazing hazard striped cake inside! 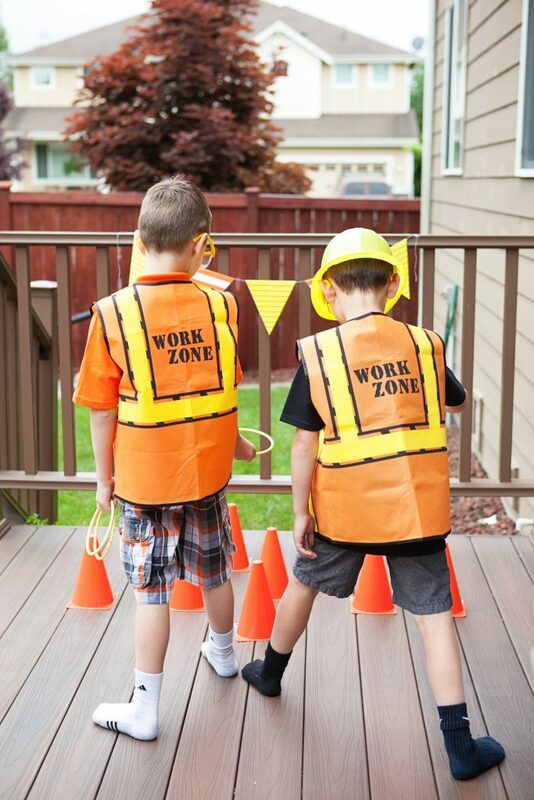 Is there anything more quintessentially construction themed than orange construction cones and yellow hard hats? We couldn’t wait to display and eat these incredibly creative cake pops by Vypassetti Cake Pops. Even after cake, and cake pops, guests were still excited to dig in and eat brightly decorated cupcakes. 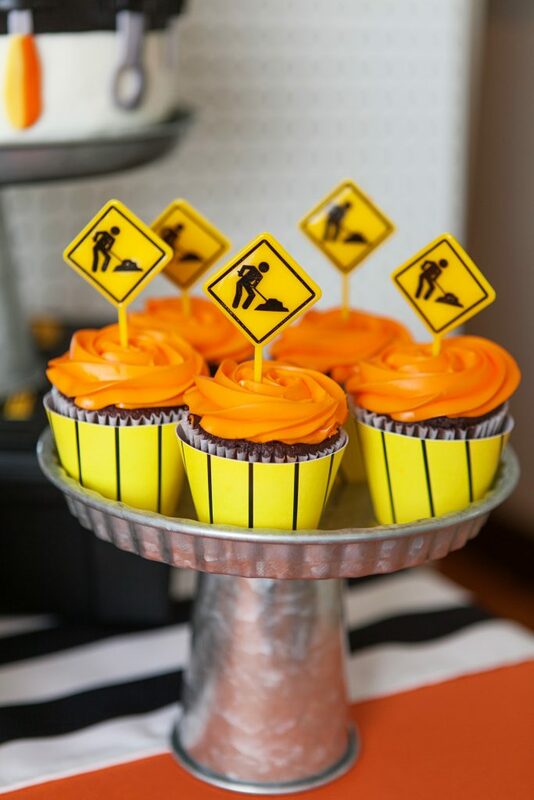 They featured printable yellow caution cupcake wrappers (Jessica’s Invites) and party picks from Oriental Trading Company. 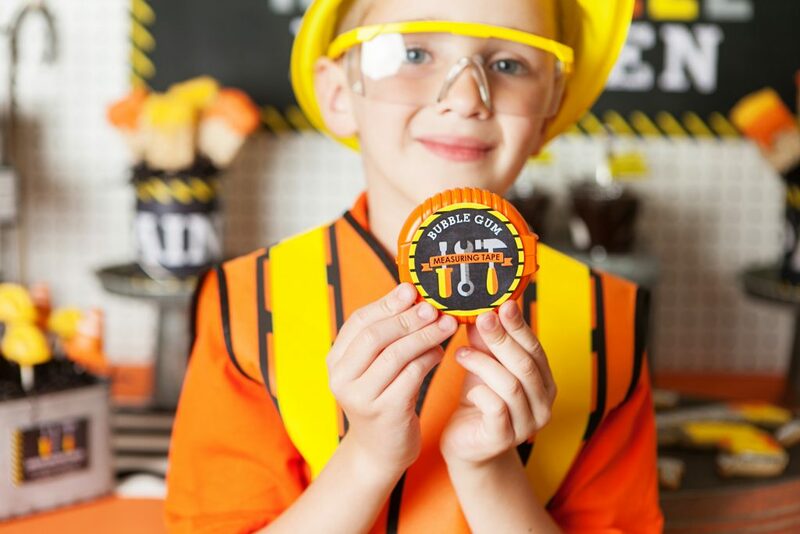 A Taste to Remember hit the nail on the head when it came to providing the most creative construction party cookies! 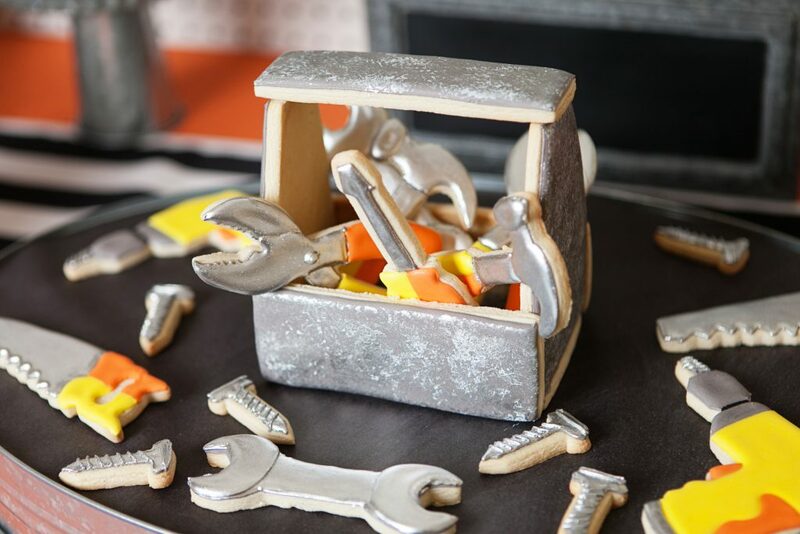 Have you ever seen an edible “galvanized” toolbox full of tool-shaped cookies? Take a closer look! You’ve seen one now! 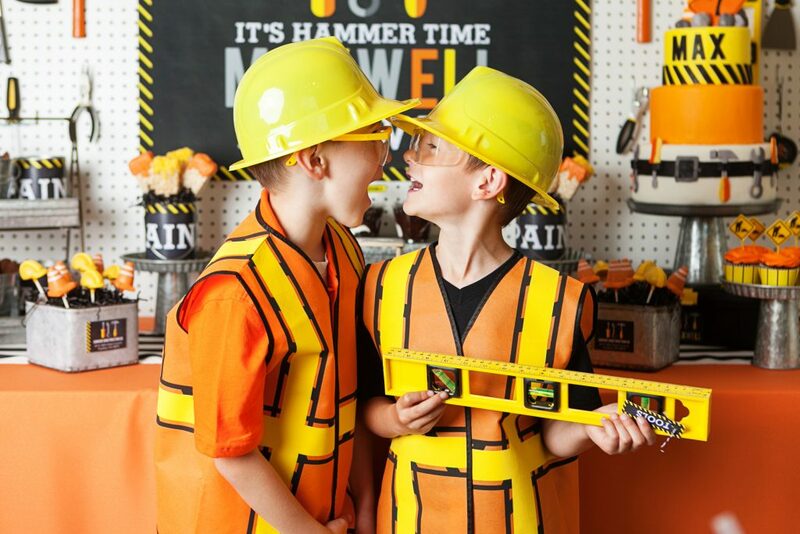 Our crew of builders had just as much fun pretending to hammer and saw with their cookies as they did eating them! 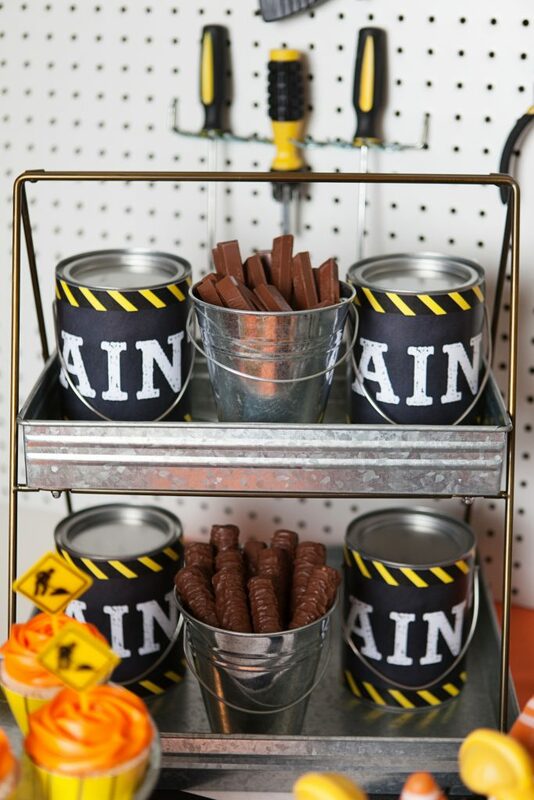 Paint pails from Oriental Trading Company made an easy option for displaying Rice Krispy paint brushes. 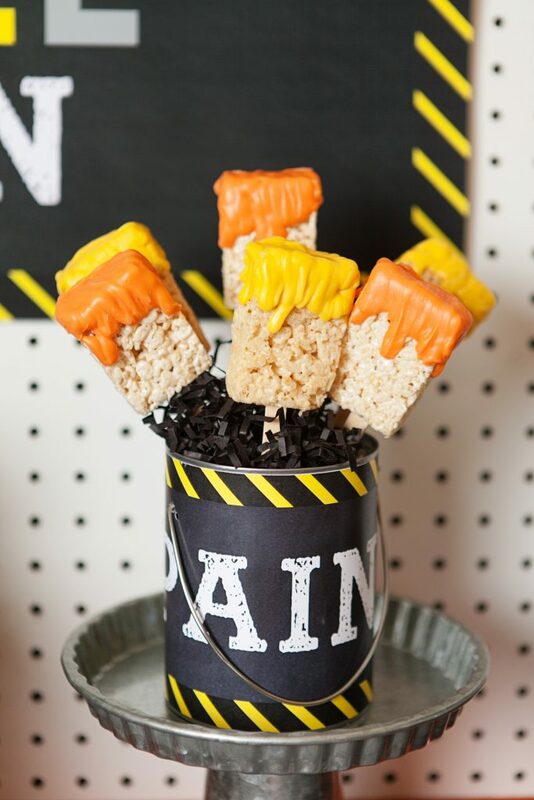 These were an easy DIY made using melted orange and yellow candy melts, premade Rice Krispy Treats, and Kraft sticks. Construction work always seems to involve some major digging. 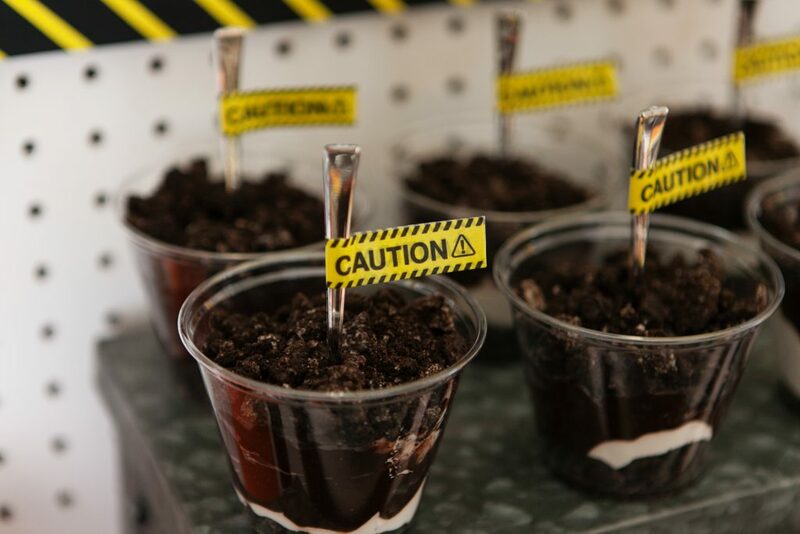 Our chocolate pudding cups contained layers of edible mud, dirt, sand and gravel. 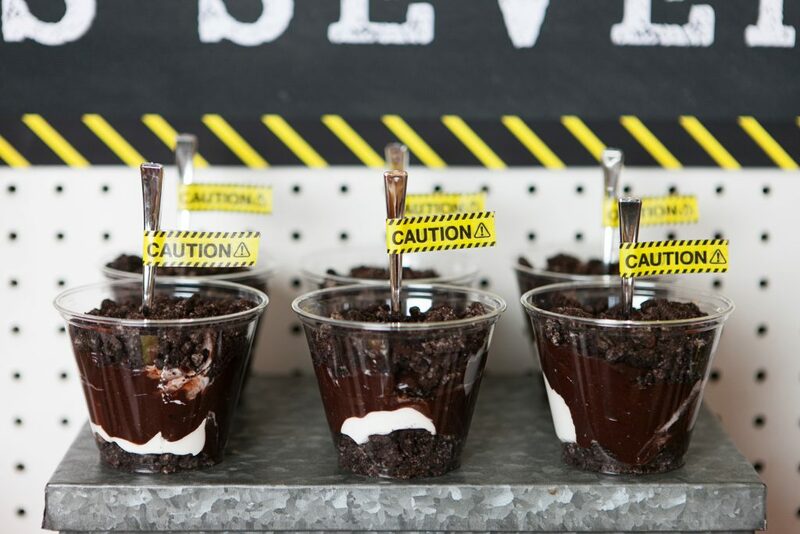 This was another easy DIY that involved layering pudding, whipped cream, edible rocks, and crushed Oreos. Mini silver spoons from the dollar store were dressed up using caution inspired washi tape. If you’ve ever visited a build site, you can attest to the fact that it is usually littered with wood planks and beams. I represented these common construction materials using Twix candy bars and Kit Kat bars. With a busy crew of builders on hand, an inviting dining area was a must! 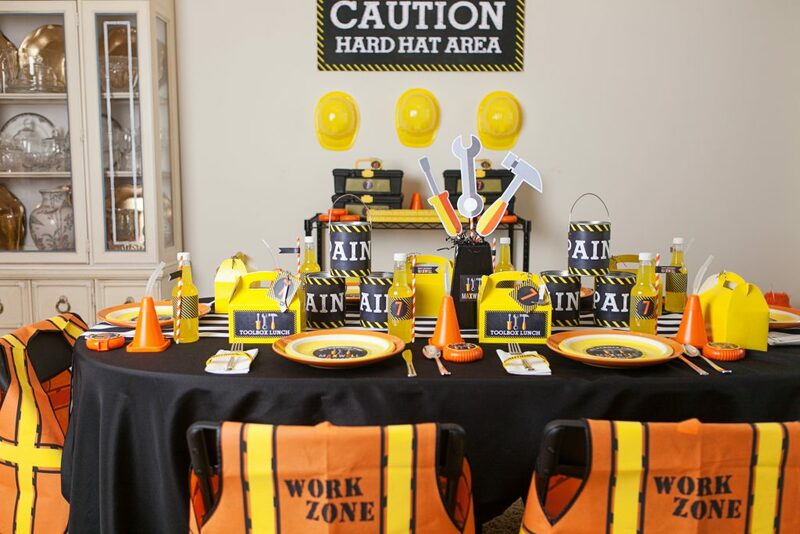 I carried the construction birthday party theme into the tabletop decor and dining area. 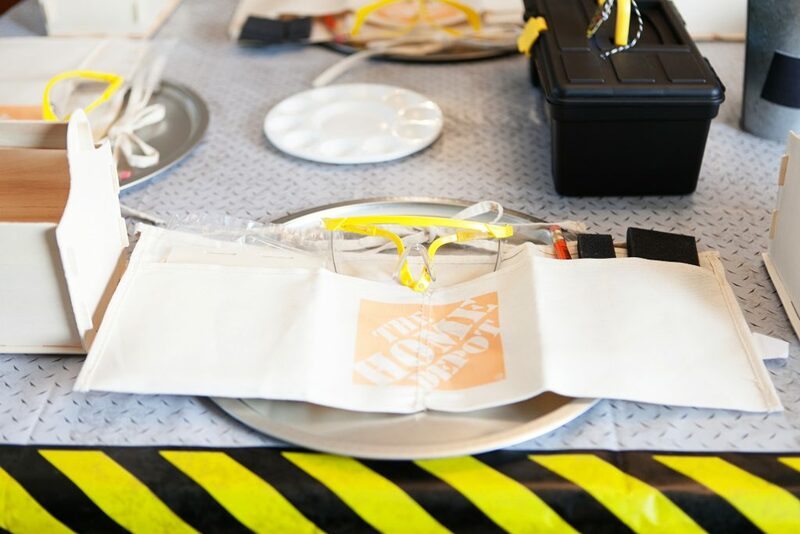 A black tablecloth provided a stark backdrop for layering bright orange dinner plates used as chargers with disposable yellow paper plates featuring custom party logos designed by my graphic designer. 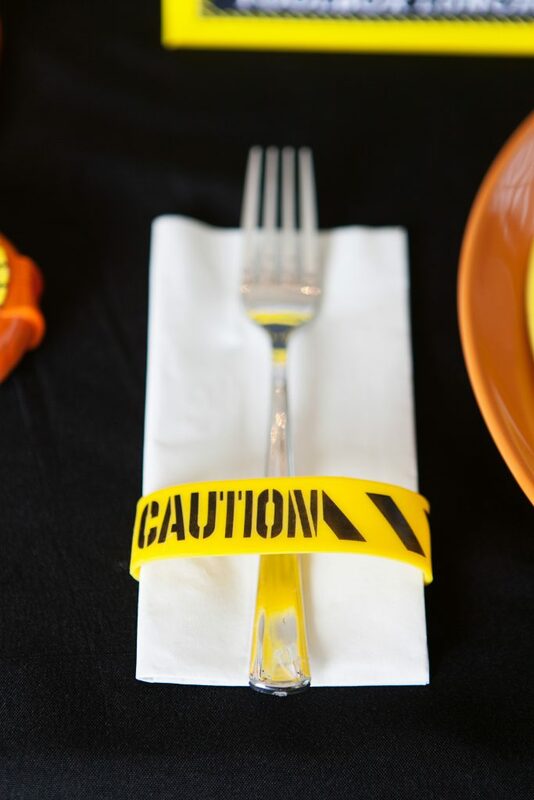 To dress up the napkin & fork, I wrapped them with construction themed rubber bracelets. Party guests came straight from school, and we knew they’d be hungry. 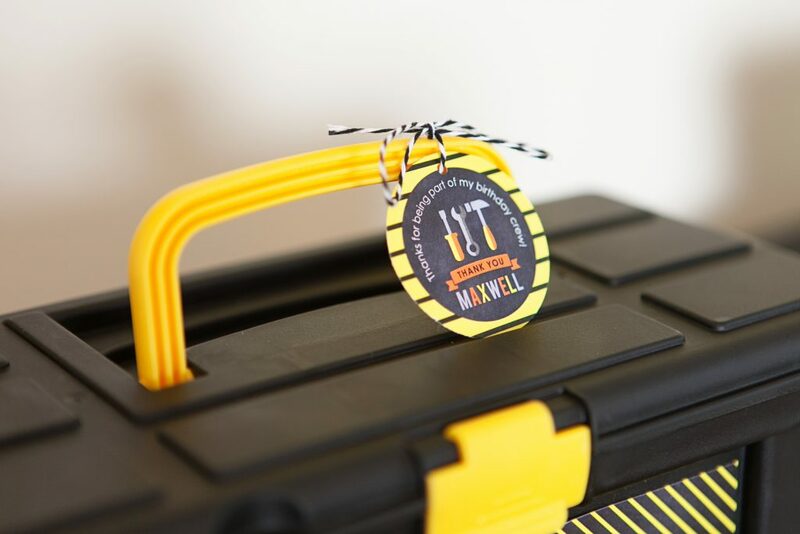 In addition to pizza, fruit (oranges), veggies (carrots), and chips (orange cheese balls), we filled yellow gable boxes from Oriental Trading Company with a variety of snacks too, and attached “toolbox lunch” labels to make them fit in with the theme. 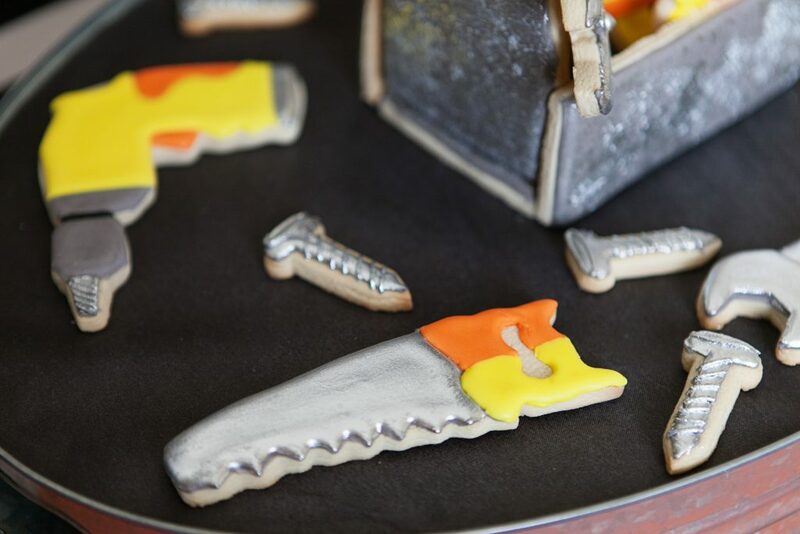 Those little tool key chains (Oriental Trading Company), were a fun embellishment. 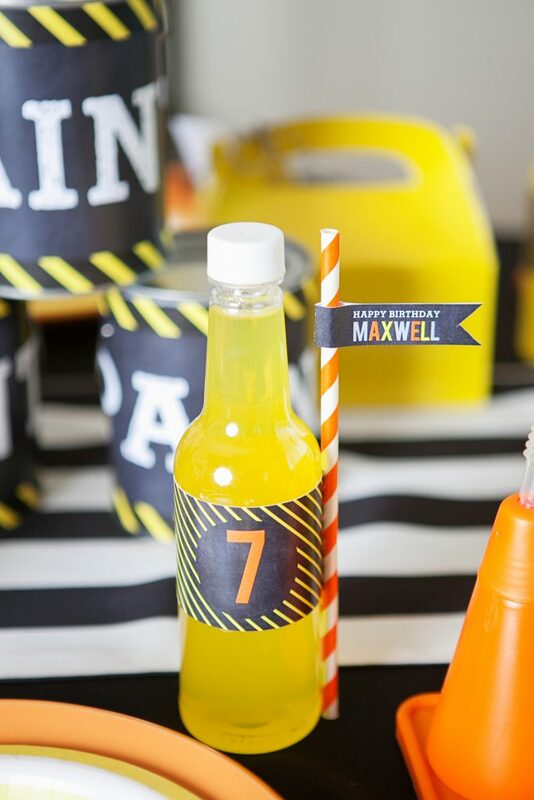 Plastic soda pop bottles (Via Blossom Shop) were affixed with custom beverage labels and filled with pineapple flavored soda. Paper straws always make things more fun, right? 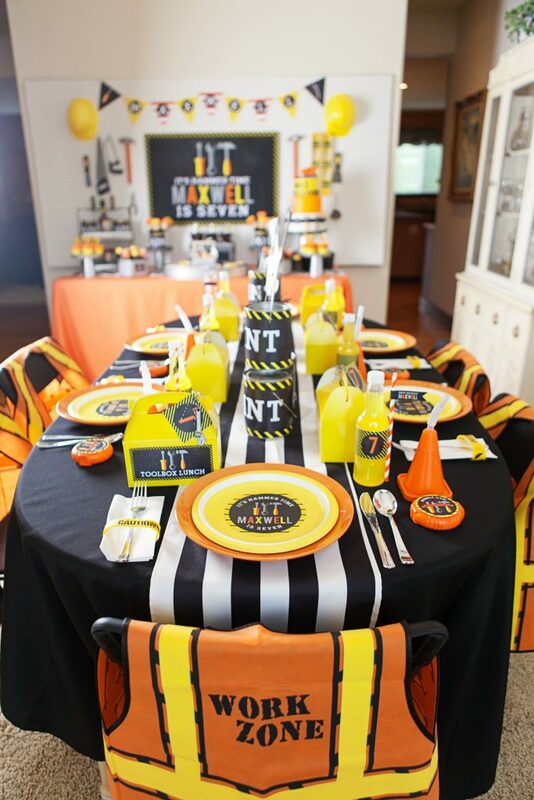 We added orange striped straws with personalized party flags to our drinks. 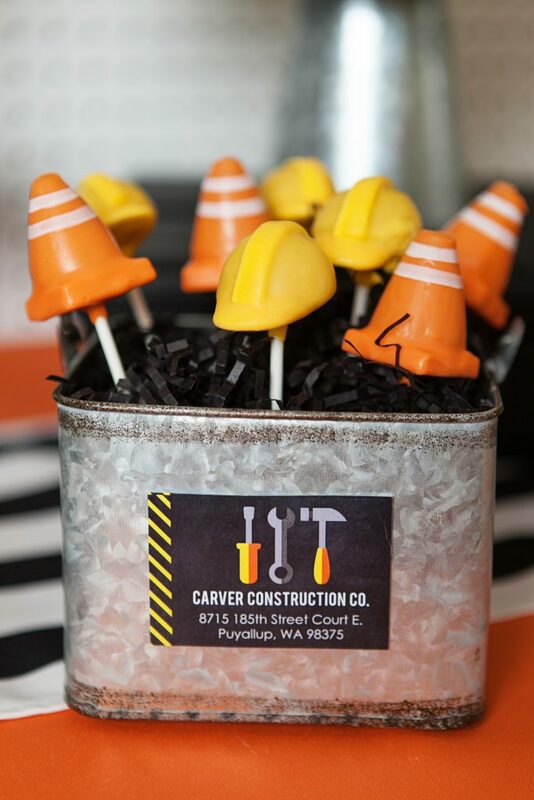 Because nothing quenches thirst as well as good old H20, we filled construction cone molded cups (Oriental Trading Company) with water to give guests plenty of beverage options. 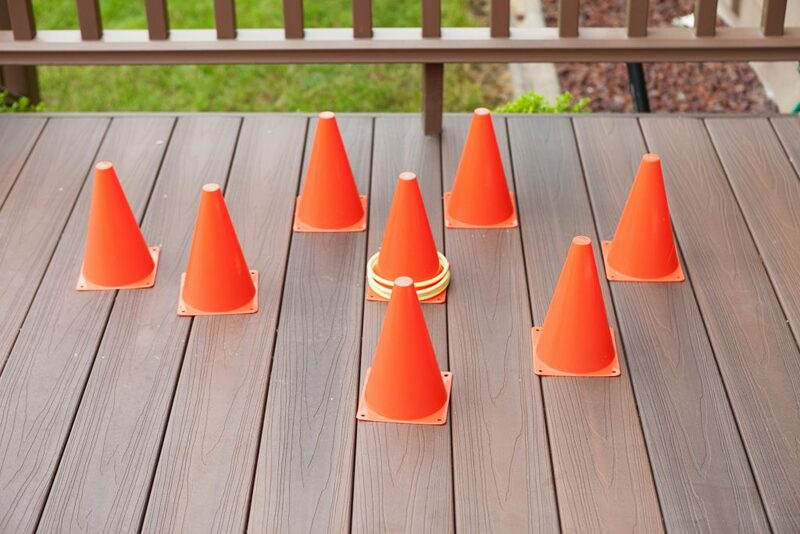 Plus, the cones were a fun theme-coordinating addition to the tabletop, and doubled as a take-home party favor too. 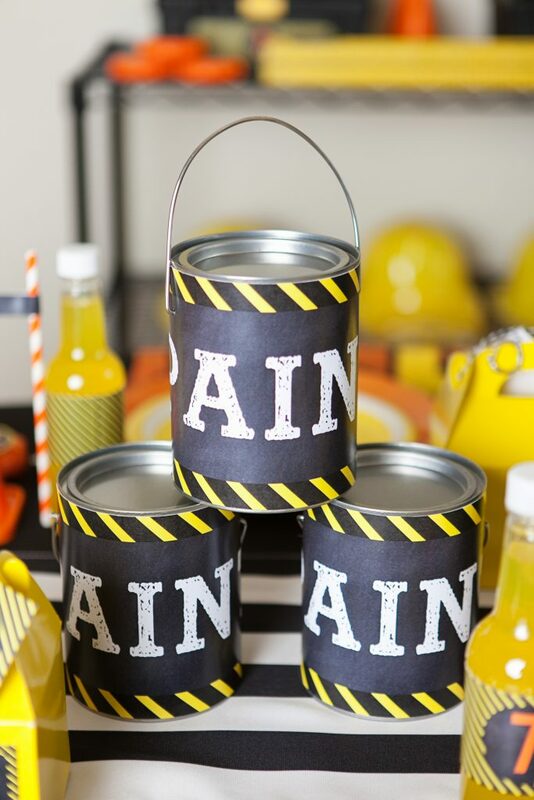 Paint cans filled with color coordinating gumballs were stacked as centerpieces during the party and were sent home with guests as part of their party favors. 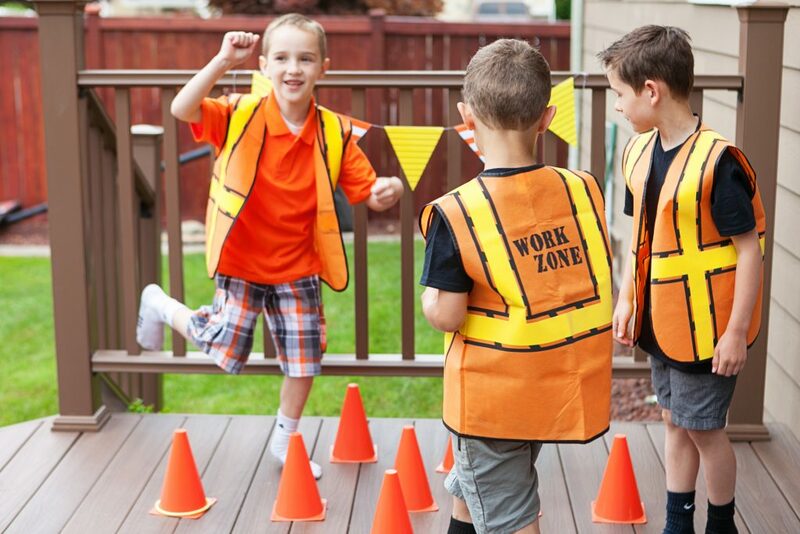 We loved displaying construction work zone vests on the backs of chairs as part of the decorations. 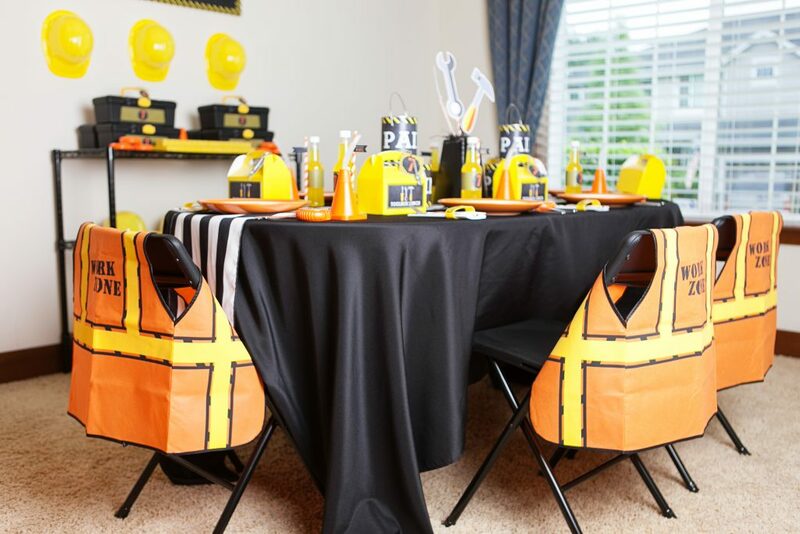 Guests loved dressing up as official construction workers during the party. 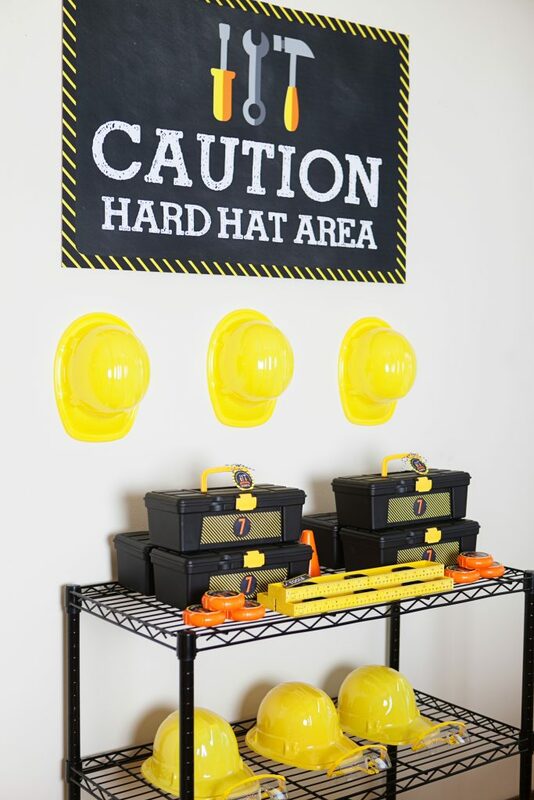 To stage and store the party favors, I created a special display area. 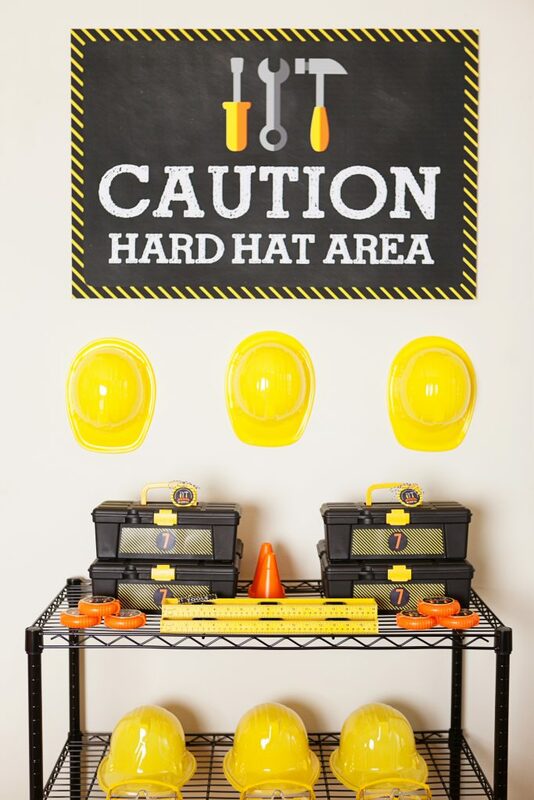 I hung an oversized “caution: hard hat area” poster and used removable Command hooks to hang plastic hard hats. 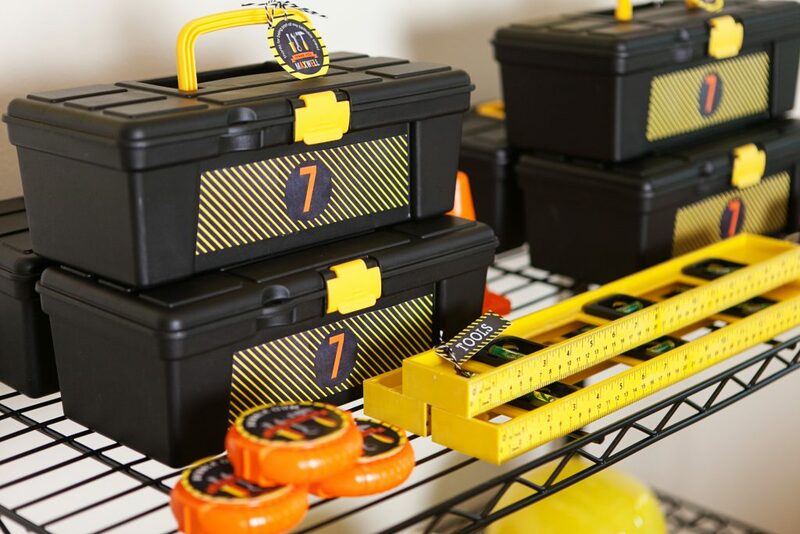 An inexpensive metal wire shelf provided plenty of space for showcasing toolboxes purchased from our local dollar store that were filled with real tools, and even a set of chocolate tools (Oriental Trading Company). 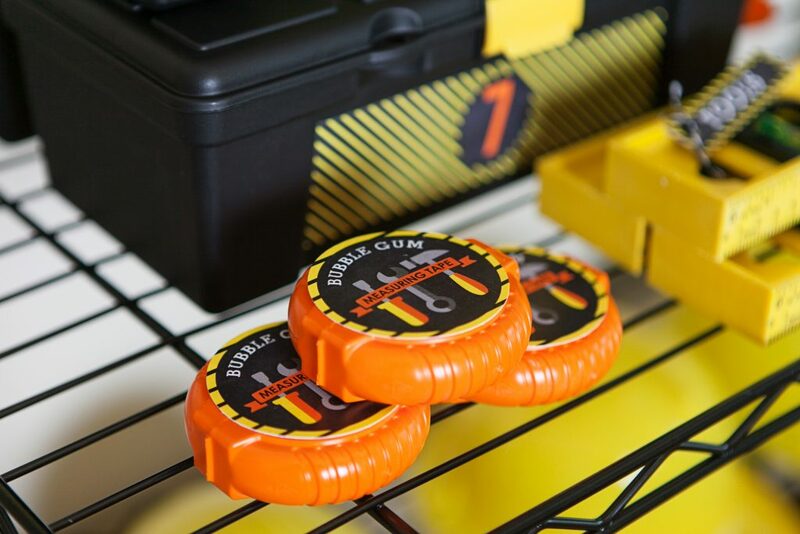 One of the favorite party favors was custom Bubble Tape that I transformed into “Bubble Gum Measuring Tape” using a printable label made for me and some spray paint (I only sprayed the outside of the container to keep the inside food safe). 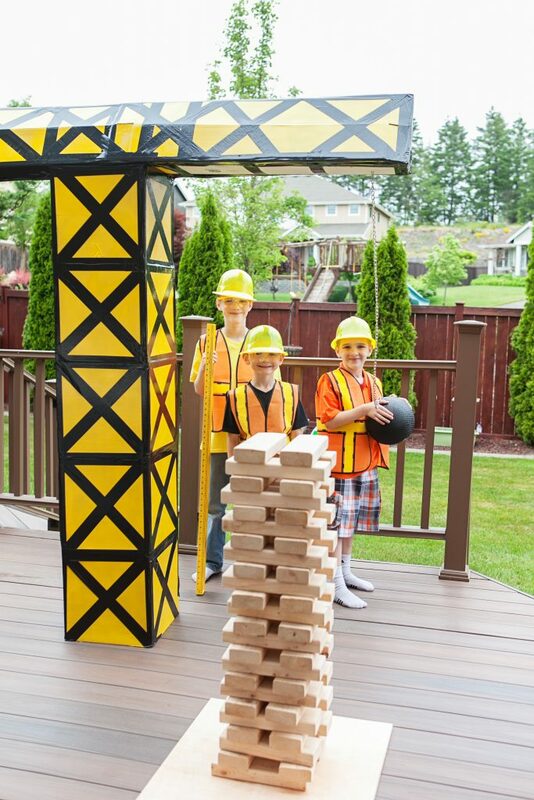 We provided the construction crew with so many fun themed party games and activities. 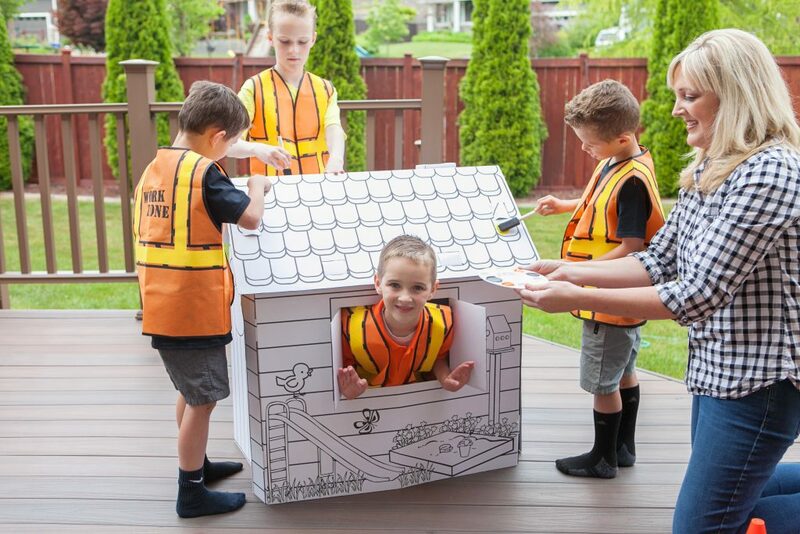 They swung at a pylon pinata, played rounds of construction cone ring toss, destroyed a building with a wrecking ball, painted a playhouse, and finished by decorating their own wooden toolboxes. Take a closer look at each activity for details. 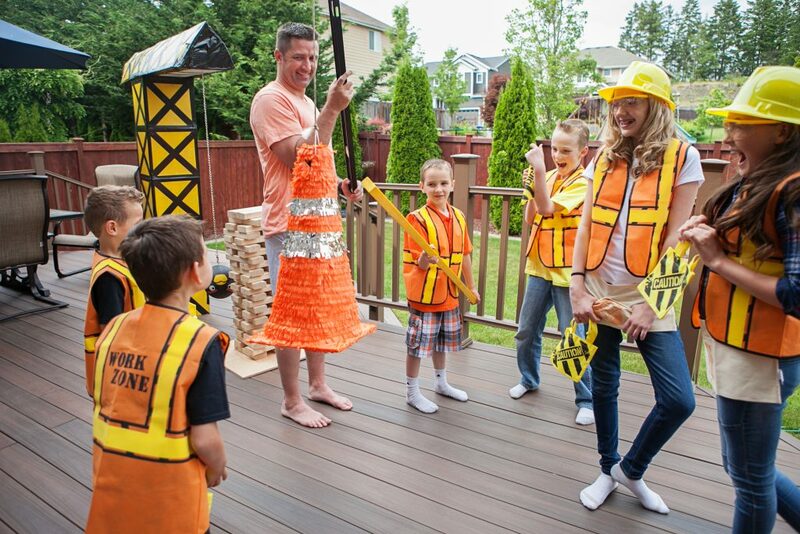 I don’t think kids ever tire of piñatas. 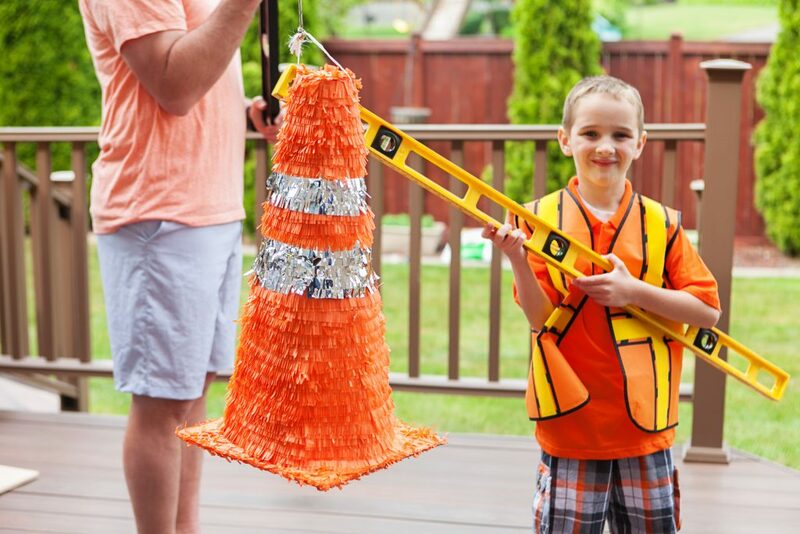 We filled this amazing construction cone piñata by Tini Pinatas with a variety of candy (including awesome construction themed suckers from Oriental Trading Company). 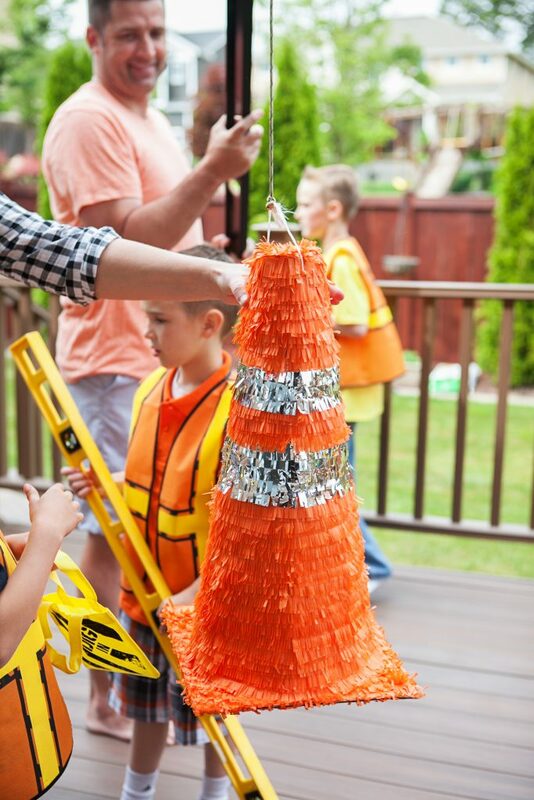 Instead of using a bat, kids used a heavy duty level to take swings at the piñata! 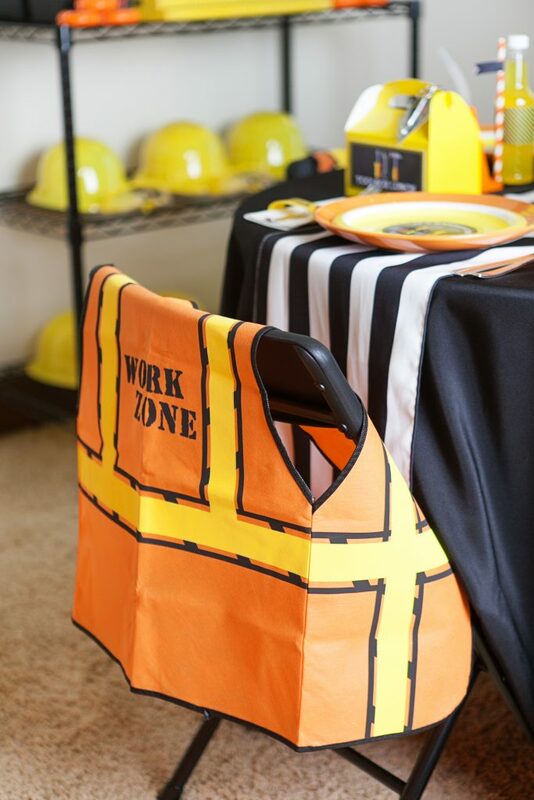 They used mini construction zone tote bags (Oriental Trading) to house all of the loot they collected once the piñata was demolished! 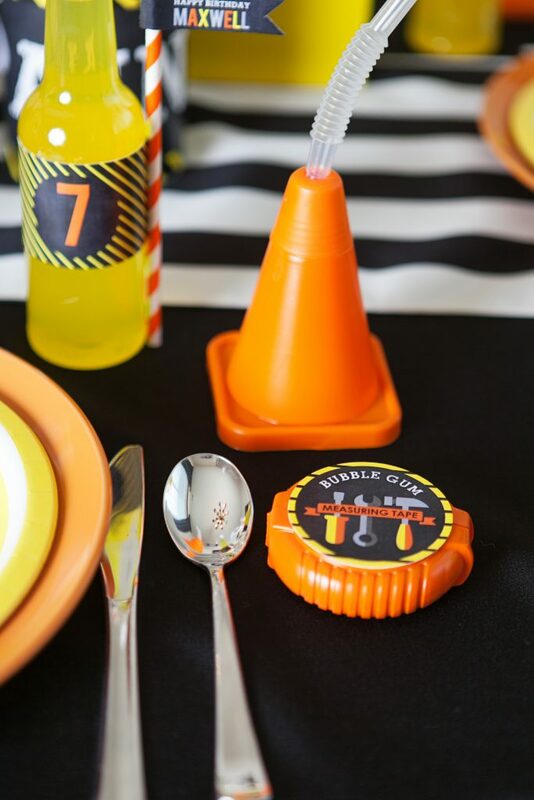 When it comes to throwing a themed party, sometimes you have to reinvent classic party games and give them a new theme-coordinating twist. 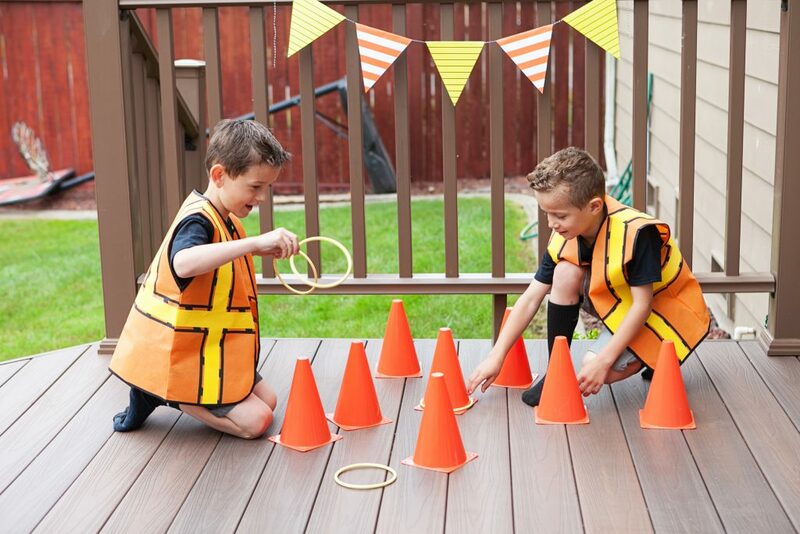 We did this with a classic ring toss game. 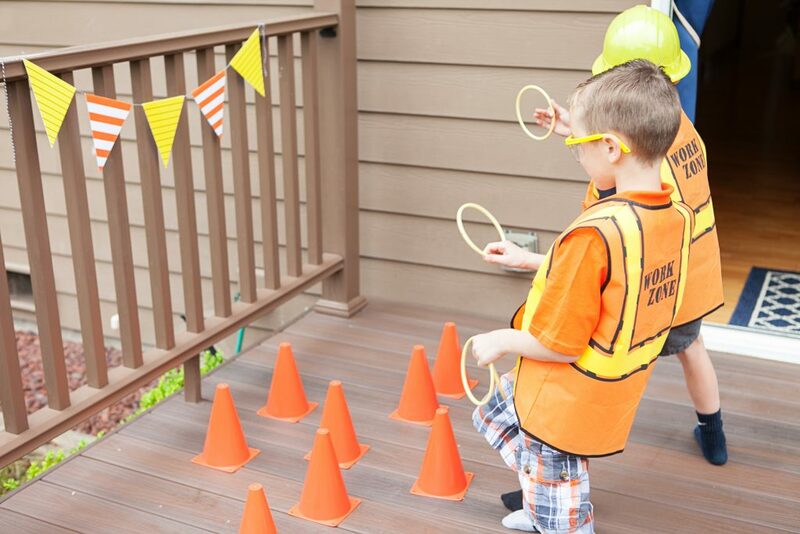 Instead of having guests throw rings around recycled bottles, we used orange construction cones (Oriental Trading Company). 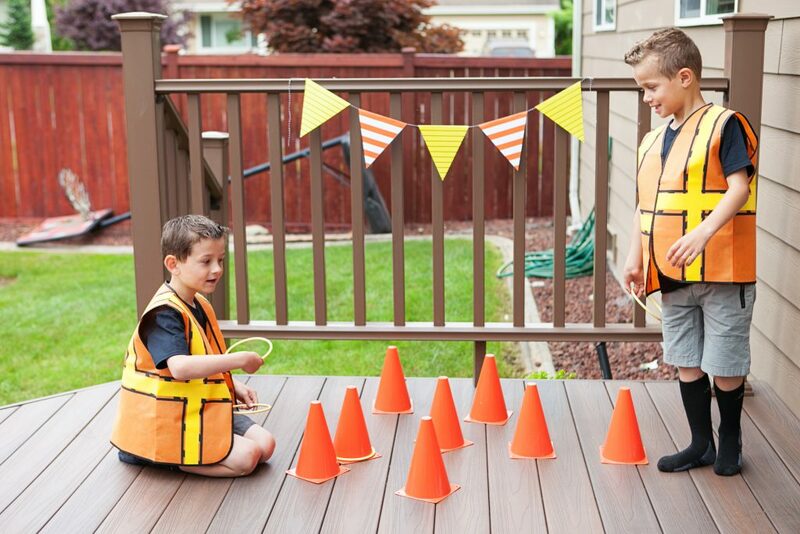 They had so much fun trying to ring the cones. My handy husband built a wrecking ball from mostly recycled materials which party guests used to knock down oversized wooden Jenga blocks. They loved using their strength to compete against one another. 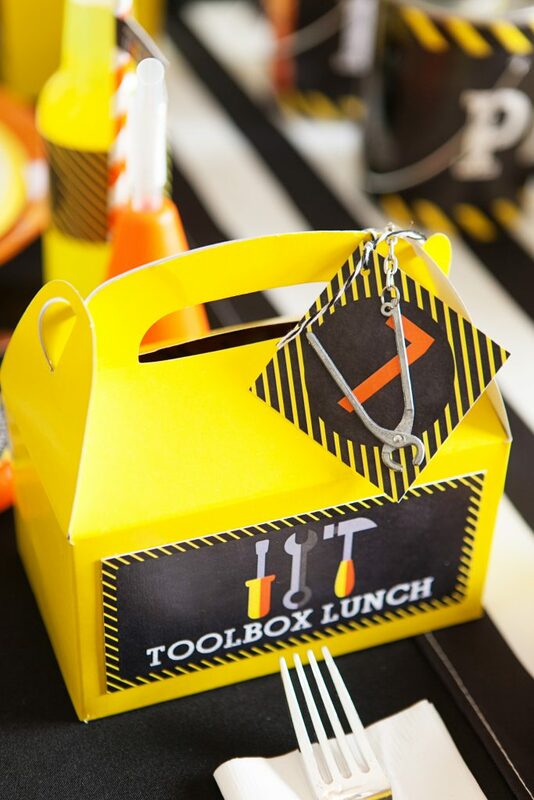 If you want to make your own, scrounge up some boxes, give them a fresh coat of yellow paint, and use black duct tape to embellish. You’ll need to pick up some metal chain to attach to an old playground ball. 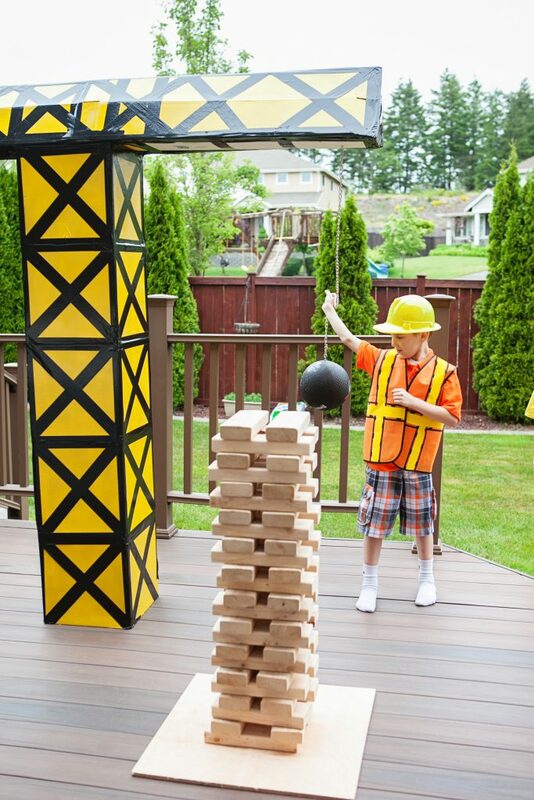 Get ready for some wrecking ball fun! Our final activity station was our build station. 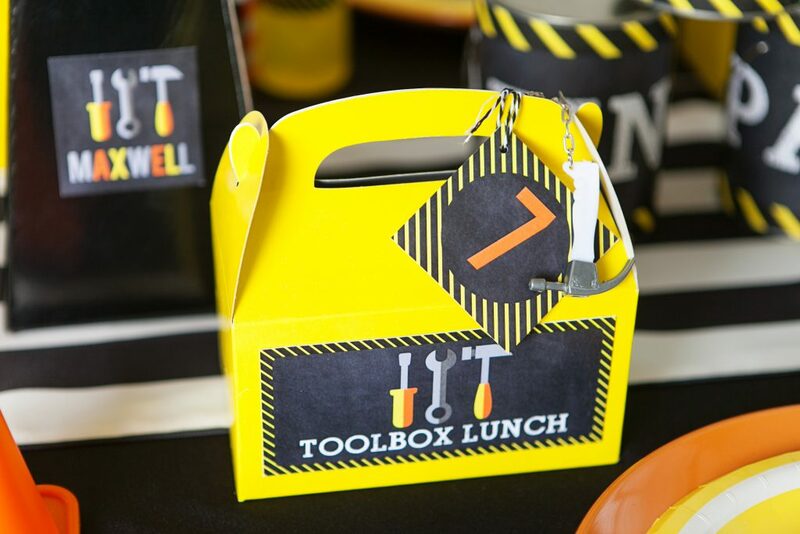 Guests got to assemble and paint their own personal wooden toolboxes. 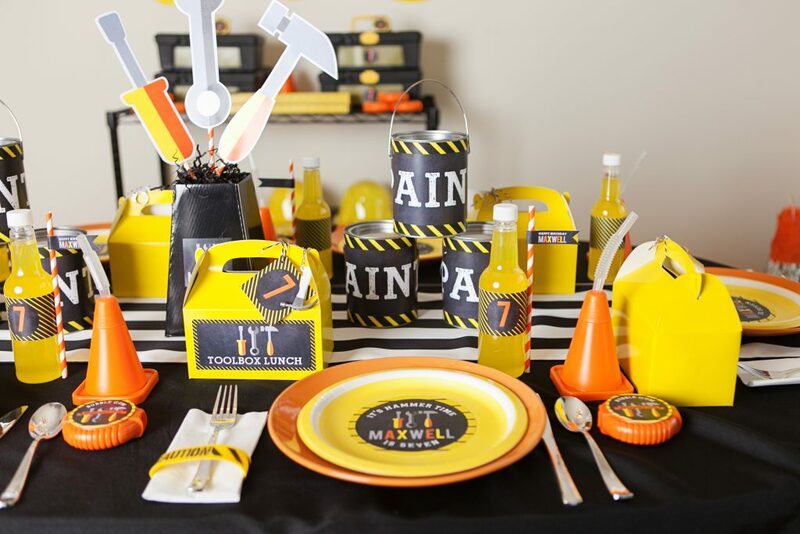 Each place setting featured a toolbox, safety glasses, and paintbrushes (Oriental Trading Company). 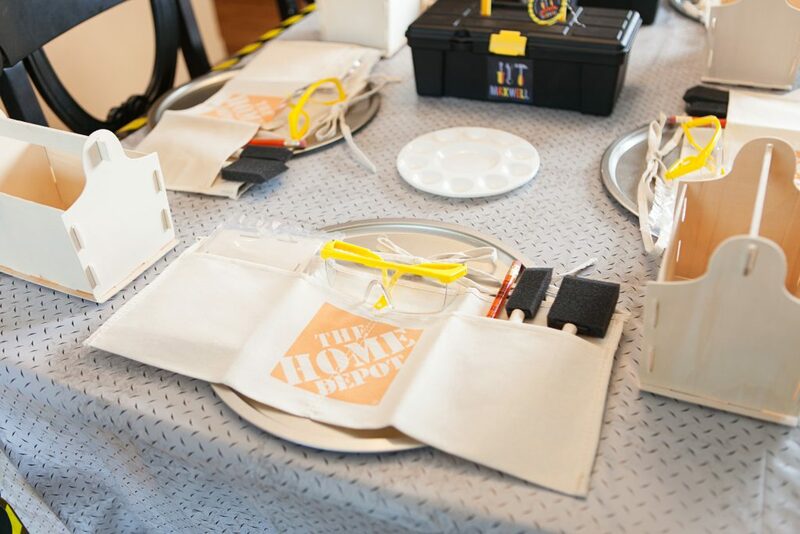 Additionally, each guest received a handyman’s utility apron to keep their clothes clean while painting. 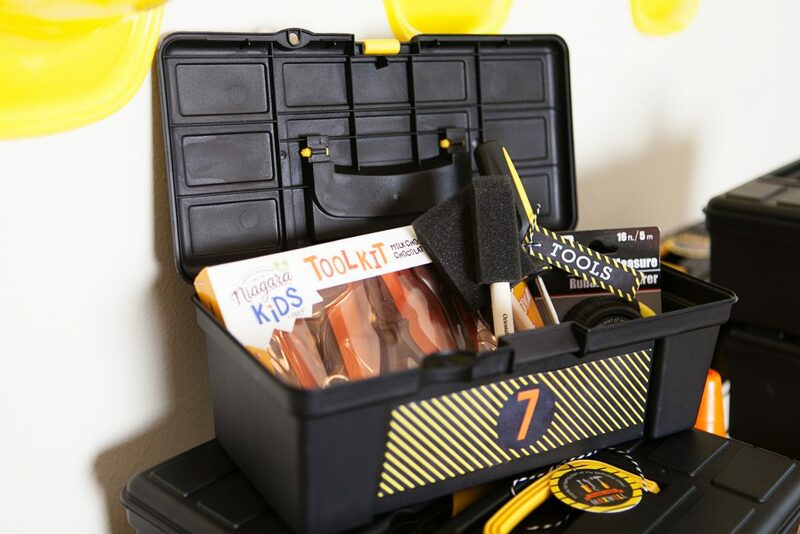 It was full of various tools and supplies. 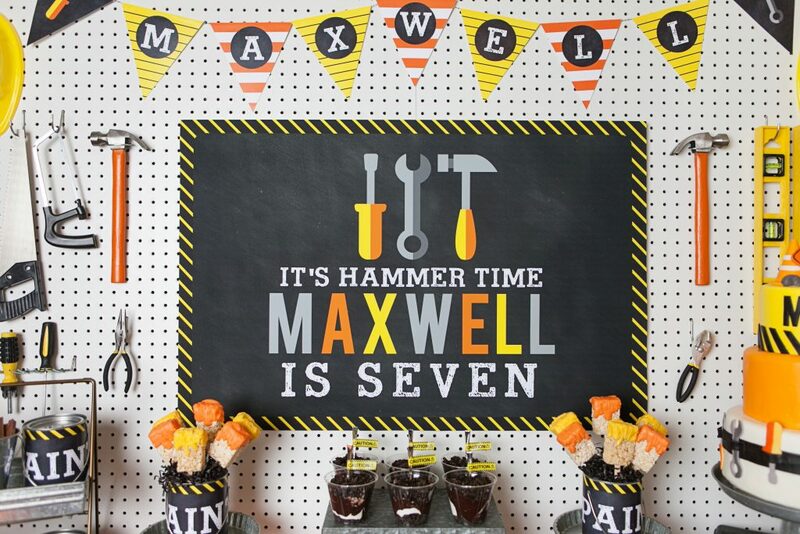 Is it hammer time at your house? 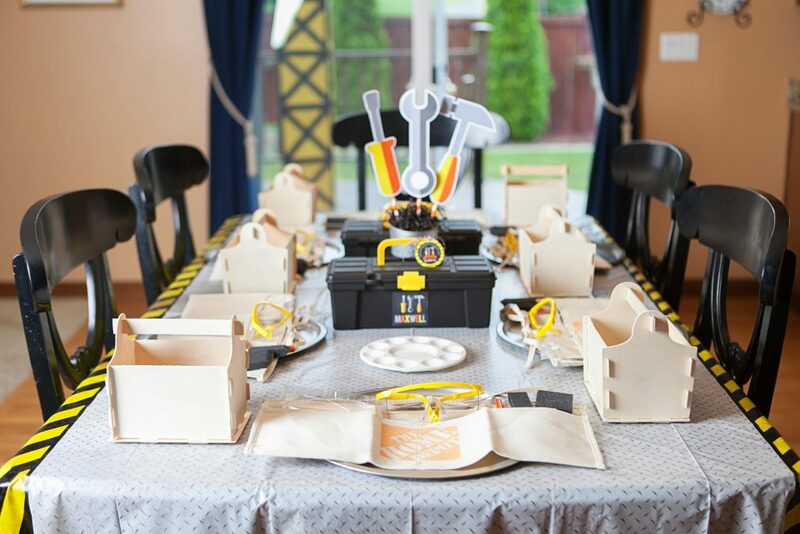 I hope you’re inspired to put together your own construction birthday party plans! 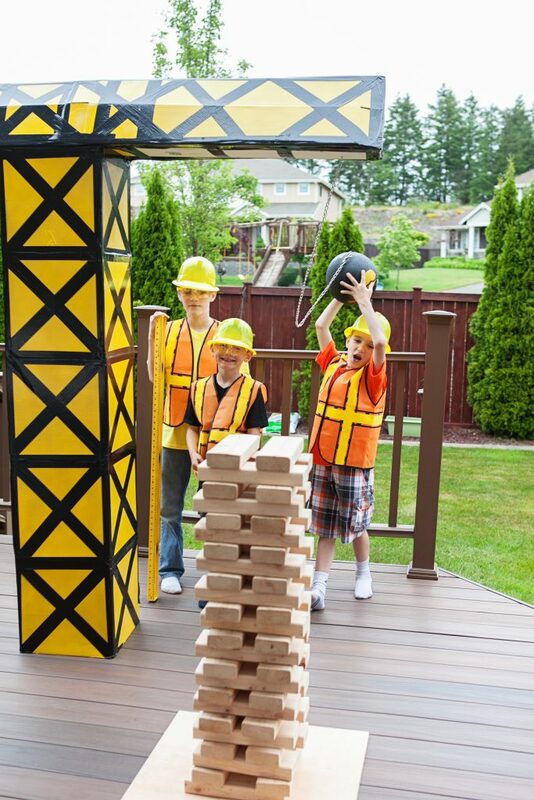 Building a fun party for my son was a lot of hard work, but well worth the smiling faces of happy kids. This entry was posted in Children's parties, General Site News. Bookmark the permalink.